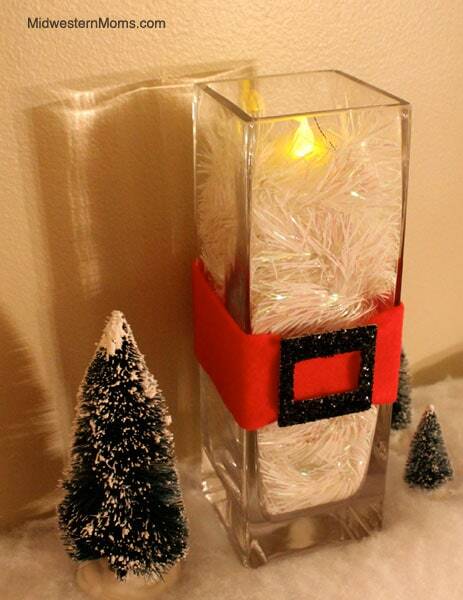 I decided to do a Santa Themed candle holder. My husband often calls me the “candle queen” because I have so many tealights, votives and candle holders sitting around the house! However, for this project, I dug deep into my wedding decorations from several years ago! I had purchased these to use as centerpiece candle holders and they were still packed away in the boxes! They are very tall and square, however this idea will work for any sized square holder. Since my holder was so tall and made for more of a vase or centerpiece, I filled it with garland and placed a battery-operated candle in the top. Those happened to also be left over from when we got married! 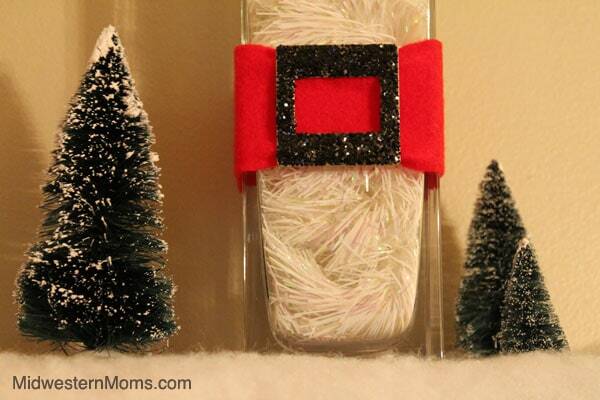 Step 1: Place Mod Podge on your frame and pour the glitter on! Tap gently to remove excess glitter. Step 2: Cut a piece of red felt the size of the holder. Also make sure that it is about as wide as the glittered frame. Place it around the holder and hot glue the edge. Choose the side that you want to place the glittered frame on. I folded the edges of the felt under and put a dot of hot glue. Then place the frame over the top as the pictures indicate below. I chose to fill my candle holder with garland since it is a Christmas theme, however you could fill it with water, marbles, rocks, or whatever your heart desires. Since I used garland, I knew that I would have to use the battery-operated candles because real fire would melt the garland if the candle wasn’t inside something else. I think it added a nice touch. Here is a full view of the finished product. It looks amazing on my shelf! Thank you for the nice compliments! I think I am definitely going to focus on doing many more crafts on the blog!